As I scurried around the house, trying to ‘put things in order’ before our little one woke up, i wondered how my mam did it with the three of us. I wondered how many more mothers were able to keep all things up. How others do it with four, five, six, or twelve children. “She must have been strong. She is strong”, quietly mumbling out my thoughts. I was already exhausted and it was barely noon. My personality could put me out as a strong willed person, but parenting exposed yet another weakness in me – I really wasn’t strong, I am not strong and never will I ever be. I couldn’t put a layer of make-up on myself when it came to being a mother. My fine lines, wrinkles and sags could not be daubed on. I was bare! Struck hard by the realities of motherhood, that i wasn’t going to be enough! As piercing as it was, It was a perfect reminder of what God called me to be. A jar of clay. I was delicate, easily broken, easily crushed, utterly dependent on Him. I couldn’t handle being a mother without being a jar of clay. 2nd Corinthians 4:6-7 says, For God, who said, “Let light shine out of darkness,” made his light shine in our hearts to give us the light of the knowledge of God’s glory displayed in the face of Christ.7But we have this treasure in jars of clay to show that this all-surpassing power is from God and not from us. Being a jar of clay doesn’t seem all glamorous. Its boring to be “packed” on a shelf. I would have wished for God to term me as an iron rod, maybe an iron pot, or better yet, steel, yes! a steel pot, but He careful chose to term us a jars of clay. You and I mommy, are a jars of clay, called to put the gospel on display through our brokenness. How encouraging it is for us to know that the power of make motherhood alive in us is not self-made nor self-generated. It is not coming from our well stacked shelf of books, our notes from the pediatricians, to-do lists from other mothers, nor the famous baby-center page on internet. That transformative power comes from God himself. Being a jar of clay served to remind me that I was nothing by my self- proclaimed strength. My “mommy life-pack” was nothing but false sense of strength. God was “busting” my pride reminding me that my dependence was to be on Christ through this season. Motherhood is a calling. A point of laying your life yet again for another human being. See, we lay our lives in marriage, die to ourselves and lay it again for the precious gifts the Lord gives us. We lay down our wills, our plans, our aspirations for the gifts that God gives us, not because we are well able to do it –but because it is in the power of His might. If I cannot be a jar of clay, then I cannot really to hold in what God has in store for my children. I will not be able to pour out on them without feeling as if my life has been “interrupted”, without feelings of discontentment, frustration or getting jaded. I will live a life comparing my now to then, wondering how it would have been, tipped off at every instance with their melt-downs and fussiness. I will be tempted to savor my life more than the purposes of God for my children. I will be faithful but not fruitful. How sad it will be to toil and never see my children bear the fruits of Christ because of my self-centeredness! To be a jar of clay, I will have to willfully submit myself to the Lord’s kiln. It will be hot, it will be uncomfortable, but His refinery purifies perfectly. I will need to be delicate enough, fragile enough to be molded into what He needs me to be for this season. It means that I will need to give up on my “strong-self”, and lay down my life on my own accord. It means that I will have to sacrifice yet again, wipe off the poop yet again, rub her belly yet again, sing ‘baby-shark do do do’ again, clean out her vomit yet again, take her to the play-ground again, correct her in love yet again, make dinner yet again, and not be discontented. It will mean not losing sight of the mundane, finding joy in everyday self-loss, not stacking my importance on what would have been intriguing, but being cognizant of the value that Lord places in me as a jar of clay. It will mean ceasing to work to perfect my mothering skills, but allow Christ to perfect me and use me as a tool HE uses to parent my children. 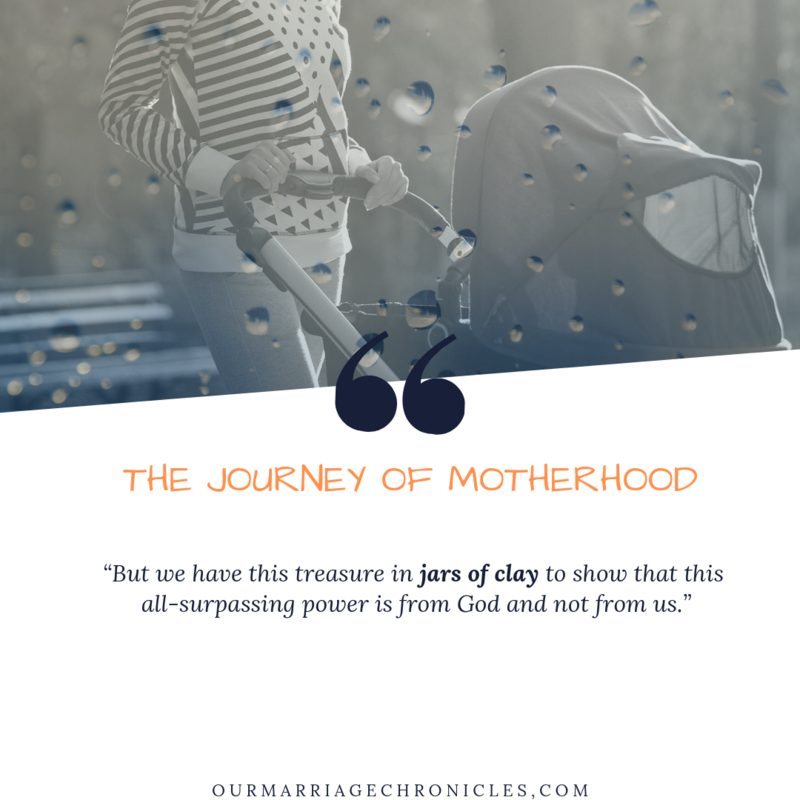 It will mean not de-valuing my weakness, but embracing my frailty, loving my fragility, for only through my jar, can my children receive the knowledge of God’s glory displayed in the face of Christ. You don’t need to put up a strong face. It’s alright to be broken, to be weak, to be dependent, for only then do we cease, and God’s power is displayed. I AM NOT STRONG, I AM DEPENDENT ON GOD! I AM A JAR OF CLAY. Previous PostTHE JOURNEY OF MOTHERHOOD - ON WAITING AND TRUSTING GOD.